This frame is meant for anyone shorter or your teenager. With its Hawaiian style it makes you feel like a local. The single-speed, rust-proof alloy wheels and easy to reach handles make this bike perfect for anyone. 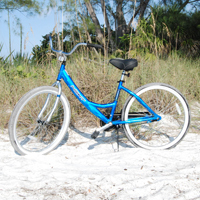 This bike also features full-wrap fenders, whitewall tires, and a spring loaded saddle making it a stylish ride as well. Paddle boarding is the newest fun sport that everyone is having a great time trying out. There are many places to try out paddleboarding around the island. Rent for a week and find a new place everyday! Our adult helmets are optional but can be provided with your rental for no extra cost. Safety is one of our most important goals at Fun and More. Our biggest bike! You can ride to dinner on a tandem bikes for a romantic island evening. See the sun set from a whole new view using our tandem bikes! Our tricycles are easy to ride and comfortable, making it a smooth ride. Put all you need in the back basket; towels, umbrellas, bags. You can fit it all! Teach your little vacationer the enjoyment of bike riding. We have many different sizes and styles of bikes for you and your family.